Welcome to Falcon Tire Center where we have dedicated ourselves to marketing and servicing passenger, truck and industrial tires in South Florida since 1985. As part of the Falcon Tire Center Group, owner Fernando Sosa has two convenient locations to bring you the best tires. At Falcon Tire, we specialize in tires and wheels of the highest quality. Offering the market's most complete warranty program. We stand fully behind our products. Falcon Tire is a pillar in the communities of West Palm Beach and Davie FL. Our goal is to focus on customer service. It is the foundation of our business. Falcon Tire employs a well-trained staff specializing in the sale and installation of passenger, light truck, truck and industrial tires. Take this opportunity to browse Falcon Tire website or call us for personalized service. West Palm Beach, FL – Looking for tires in West Palm Beach, FL then Falcon Tire has the right tires for your car or truck. In West Palm Beach Falcon Tire offers mobile service to your yard or office at no extra charge. Give our West Palm Beach, FL location a call at (561) 689-1776 today to schedule an appointment. Davie, FL – Looking for tires in Davie, FL then Falcon Tire has the right tires for you. Our Davie location is a full service shop. Drive in or schedule a road service by calling (954) 584-4417 today to schedule an appointment. 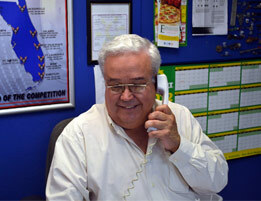 We are South Florida's Top Automotive Business. Falcon Tire, serving customers in Fort Lauderdale, West Palm Beach and Miami, FL, has been dedicated to providing the best in tire services, reliable products and competitive prices since its establishment in 1985. Copyright © 2013 Falcon Tire Center, Inc. All Rights Reserved.